In his 19 years as New England Patriots head coach, Bill Belichick has had a small number of notable postgame handshakes. The one with Green Bay Packers head coach Mike McCarthy at Lambeau Field in 2014 is definitely among them. Belichick truly seemed to appreciate the challenge that McCarthy presented at the highest level of competition, with McCarthy explaining that day that Belichick was “very gracious” in his remarks. 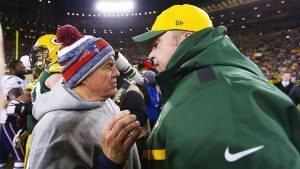 “Stating the obvious, he’s the best in football, for a number of reasons,” McCarthy said this week when asked about Belichick. “I think not only do they challenge you schematically week to week, [it’s] how their research and development and game-planning process is put together. They’re going to challenge [you]. Belichick is currently the NFL’s longest tenured head coach with the same team (now in his 19th season with the Patriots), while McCarthy is tied for the third-longest tenure, 13 years, along with the Saints’ Sean Payton. The Bengals’ Marvin Lewis is second, at 16 years. That often gave Rodgers extended time to throw — during one play he held the ball for more than 10 seconds — and forced cornerbacks to cover longer by using a “plaster” technique of mirroring pass-catchers. Rodgers, who led the Packers to a 26-21 victory, noted that it was a different approach compared to what he usually saw.